Has the Obama Administration Given Up on Preventing a Nuclear-Armed Iran? Iran could have the capabilities to build a nuclear bomb almost immediately after the first 13 years of the emerging nuclear deal, President Barack Obama acknowledged on Tuesday...Pushing back on criticism that the deal allows Iran to keep enriching uranium, Obama told NPR News that enrichment isn't the prime concern because Iran will be capped for a decade at 300 kilograms — not enough to convert to a stockpile of weapons-grade material. "What is a more relevant fear would be that in Year 13, 14, 15, they have advanced centrifuges that enrich uranium fairly rapidly, and at that point, the breakout times would have shrunk almost down to zero," Obama said. That quote I think that people are referring to — I think his words were a little mixed up there — but what he was referring to was a scenario in which there was no deal. And if you go back and look at the transcript I know it’s a little confusing — I spoke to the folks at the White House and read it a few times — it’s my understanding that he was referring to — even though it was a little muddled in the words — to a scenario in which there was no deal ...it was more of a hypothetical, ‘well look, without a deal, this is what could possibly happen.’ He was not indicating what would happen under an agreement in those years. This is the nightmare scenario, the culmination of more than a decade of progressives and foreign-policy wonks convincing themselves that Iran isn’t really what it appears to be, and that a long, lasting peace can be reached with apocalyptic mullahs with a long history of using terrorism to achieve their goals. The foreign-policy “smart set” averts their eyes from Iranian leaders’ rambling about magical green auras and world leaders not blinking in their presence, chanting “Death to America!” and Israel every Friday, pledging to wipe other countries off the map, and the Iranian regime using children to clear minefields. HH: Now critics of the critics of the so-called deal say that we are without alternatives, to which you respond what, Bret Stephens? BS: Well, of course we’re with alternatives. I mean, this is one of the most staggering comments I’ve ever heard. We’re without alternatives only if you accept that there’s no such thing as coercive diplomacy, only if you accept that John Kerry is the most brilliant negotiator the world has ever seen since Mark Cuban or Bismarck. I don’t accept those propositions. Only if you accept that Iran is the strong, is a superpower and America is a weakling that must accept, basically, whatever is handed to it, that’s just completely false. We actually were in a very strong position before the interim agreement in late 2013, because the Iranian economy was moving into freefall, as the President himself says. It was precisely on account of these sanctions that we were able to move Iran to the table. So what the extension, and in fact the strengthening of the sanctions have made the Iranians more pliable, not less, in terms of these negotiations. You know, people say we had sort of maxed out on sanctions, but that’s actually the furthest thing from the truth. We were only getting started in terms of the sanctions, in terms of the ways we could have damaged the Iranian economy, and basically said to them you can have an economy or you can have a bomb. But you can’t have both. We abandoned that leverage back in November, 2013, which is why I denounced the joint, the interim agreement. And now we find ourselves with this terrible deal. If you had, again, the kind of sanctions backed by a realistic threat of military force, then we could have had a much, much stronger deal that would not have allowed them to keep the Fordow facility open, that would not have allowed them to maintain such a robust enrichment capability, that would have insisted on snap, anytime, anywhere, no notice inspections. These are the sorts, that’s the sort of leverage we could have exerted if Obama hadn’t just given it up as the first order of business. HH: Now I want to talk specifically, because I think you’re right. You have to confront the best argument of the other side in order to be persuasive. Their best argument is that we are suggesting military force, to which I respond yes. The tanker war by Reagan, President Clinton’s Desert Fox campaign against Saddam, are examples of military force of a limited duration that would be applicable in this situation. Am I wrong, Bret Stephens, that those are far short of the sort of war that people say we are suggesting? BS: Yeah, I mean, this is the classic Obama method, which is there is my reasonable, sound, decent alternative that perhaps has a few small flaws on the edges, and there’s your way, which is essentially nuclear Armageddon, and that’s just, it’s just a, it’s a cheap way of arguing that should be beneath any president of the United States, especially presumably one who is sort of trying to win over some members of his loyal opposition. But it’s also, strictly speaking, absolutely false. There are all kinds of military actions that are well, well, well short of another Iraq war. 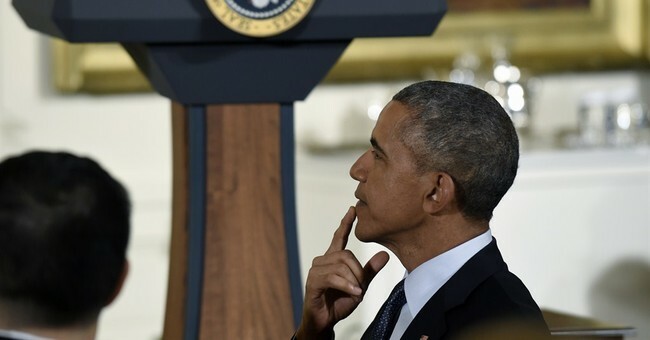 In 2012, Obama said he was "determined" to prevent Iran from achieving its dangerous nuclear objectives, and promised to use every tool at his disposal to do so. Now he's talking about Iran becoming a threshold nuclear state just as soon as his weak deal begins to expire. Given this extraordinary "evolution," how can he be trusted to make the tough, necessary decisions to protect America and her allies?